So many string quartets celebrate anniversaries of longevity with Beethoven, who will always fill seats. Last Wednesday at Kings Place, it was good to see the Sacconis doing something different. Something different is indeed what they have been doing for 15 years. They retain a base of appreciation in those chamber-music societies around the UK which survive despite everything. Perhaps the music their membership cares about never goes out of fashion, because it’s never been in fashion. The ‘Hoffmeister’ K499 is the overlooked gem of Mozart’s mature string quartets, nestled between the six he dedicated to Haydn, and the last three written for the King of Prussia. The Sacconis duly gave it care and attention. The opening Allegretto tempo and descending main theme used to be the cue for quartets to settle into the piece as if sinking into a well-loved sofa. Those days are gone. Light and bright in tone, much of the first movement was played almost under the Sacconis’ breath. The ensuing edginess made a striking contrast with one of the loveliest of all Mozart’s minuets – my own favourite – in which violist Robin Ashwell emerged with the most achingly bittersweet of countermelodies. Again, it is not the modern way to love these pieces to death, so the turn back from trio to minuet was not dwelt over. Just so they also kept the pulse going to the very end of the corresponding movement in Mendelssohn’s final quartet, Op.80 in F minor, if to much more chilling effect. This really was played on the edge of silence, just as Mendelssohn wrote it staring into the abyss, distraught at the recent loss of his sister Fanny and well on his way to working himself into an early grave. The Sacconis have made a speciality of Op.80, and recorded all Mendelssohn’s quartet music. It’s hardly celebration music, whatever the anniversary, but the piece rarely fails to stun an audience into grim silence and then feverish enthusiasm, as it goes for the musical equivalent of jumping off a cliff. The finales of both Mozart and Mendelssohn were slightly scrappy and unfocused on this occasion, but the quartet’s poise returned in the second half, with a first London performance of Jonathan Dove. In Damascus sets fragments and meditations by the Syrian writer Ali Safar, in a sparely direct English translation by Anne-Marie McManus. 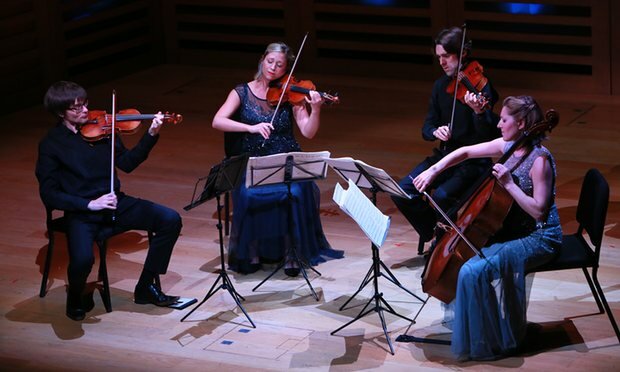 The quartet had given the first performance in May, at their annual festival in Folkestone – somewhat beyond the usual metropolitan hubs of new music – and accompanied the tenor Mark Padmore. He is the leading exponent in the world today of semi-sacred music theatre such as In Damascus proves to be, and indeed the parallels with the Passions of Bach, the church parables of Britten and the opera-oratorios of John Adams are unembarrasedly embraced by Dove in a powerfully emotive, 35-minute narrative which always put the text first. The dead and dispossessed of that city are mourned with dignity. Without begging for pity, text and music plead for sympathy. Since the concert took place, Padmore and the Sacconis have made a recording which deserves the widest possible audience. Posted on July 20, 2016 by Peter Quantrill	This entry was tagged Adams, Beethoven, Damascus, Dove, Mendelssohn, Mozart, Padmore, Sacconi, Syria. Bookmark the permalink.